Extracting a chemical from water into a solvent (or the other way round) would be much simpler if you could easily calculate partition ratios between the two liquids for the desired chemicals (the “good stuff”) and the undesired chemicals (the “bulk”) that are usually around to make life difficult. There are two ways to look at the problem. 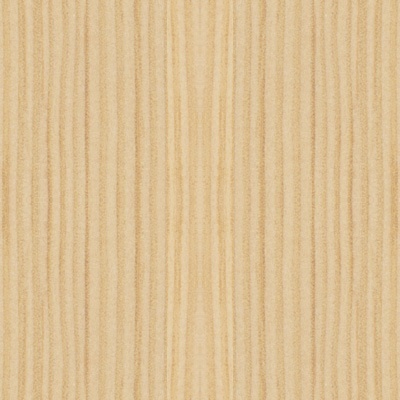 The first has the merits of simplicity, clarity and fitting in with the general approach of HSPiP. The second is theoretically interesting but shows some limitations to the first approach which we are doing our best to understand. Let’s assume that you have a bulk material containing your chemical of interest. All simple processing (e.g. filtration) has taken place with the bulk and any obvious way to extract the good stuff via a simple process (e.g. crystallisation from a simple solvent) has been excluded. So you have two problems. The first is to dissolve the good stuff. The second is to not dissolve the unwanted stuff. 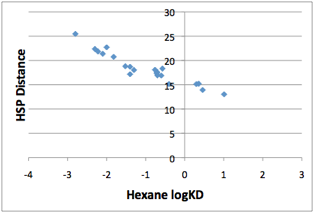 From the HSP of the good stuff you will quickly identify a set of good solvents from their close HSP match – the Solvent Optimizer will do that nicely. The real difficulty is with the bulk. Here the recommended way forward is to do a classic 20-test tube Sphere experiment to get an approximate centre and radius for the bulk. Then you need to select an extraction solvent that is sufficiently near the edge of the Sphere yet sufficiently close to the good stuff to be effective. One subtle variation of this goes back to the old “problem” of Sphere radii. Suppose you want to extract from a polymer. If you do a Sphere test based on solubility you will get a small radius. If you do the test based on swellability you will get a large radius. [In practice you would just do one test but score “soluble” as 1 and “swellable” as 2 and calculate the Sphere with a 1 then a 2 as the criterion]. You can now choose your extraction solvent as one that is both reasonably good for your target compound and also in the swellability portion of the Sphere so it has a chance to get inside the polymeric mass to do its extraction. If you find that there is insufficient distance between the bulk and the good stuff then it’s highly likely that liquid extraction isn’t a great method for this particular mix. Of course you might be lucky. If you are doing water/solvent extraction it might be that the bulk material is specifically biased towards the water, in which case your choice of solvent will be based on HSP distance, water immiscibility and then cost/safety/environment considerations. The point of this section is that although HSP may not provide all the answers they do provide a rapid means of assessing probabilities of success or failure. The calculation of liquid/liquid partition ratios would, from simple theory, depend on MVol and HSP Distance2, i.e. the chi parameter. So what’s stopping us from providing a liquid extraction modeller to HSPiP? There are two key problems here. The first is that the water can sometimes contain some solvent and the solvent can contain some water. 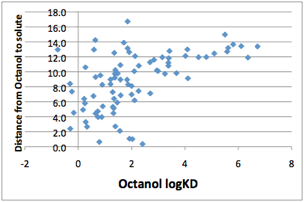 The classic example is octanol/water where the water contains essentially no octanol but the octanol contains 20% (molar) water. The second is that water itself is so odd. As discussed elsewhere in this eBook, the solubility of many molecules in water is influenced less by HSP distance and more by the “hydrophobic effect” which is mostly a size-related issue, so that larger molecules are generally much less soluble in water unless they contain plenty of alcohol, amine or acid functionality or are salts. The two correlation lines in there need urgent explanation, as do those very scattered points that are clearly outside any correlation. The lower line comes from carboxylic acids, esters and ketones. The scatter comes from amines (which are highly chaotic) and then (mostly) from compounds such as vanillin or hydroquinone with hydroxyl groups plus other functionality. We can perhaps excuse the amines as their state of protonation will make a large difference in ratios, and small amounts of spare acid or base in the system can make large changes to the ratio. This leaves us with the hydroxy-containing molecules and the problem of alcohols and amides. The Ruelle method for calculating the hydrophobic effect seems to offer a good explanation for the hydroxyl/alcohol/amide exceptions. Their (in)compatibility with water is modified by their ability to hydrogen bond with the water molecules and therefore reduce the hydrophobic effect. They are therefore more soluble than their HSP distance would suggest. The problem arises in multi-functional hydroxyl molecules. If, for example, they have strong intra-molecular hydrogen bonds, they will appear more like non-hydroxy molecules to the water so will be less soluble than a similar molecule (e.g. an m-hydroxy instead of an o-hydroxy) which has no intra-molecular hydrogen bonds. 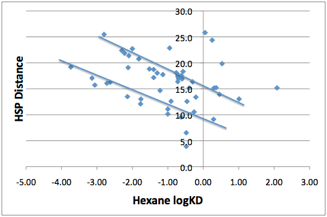 Solvents such as carbon tetrachloride and benzene show similar tendencies to hexane, so predicting liquid-liquid extraction should be possible if HSP distance and a Ruelle correction term are included in an overall formula. But chloroform and diethyl ether both show a different set of non-conformities. We are currently investigating possible root-causes for the problems with these solvents. A potential problem is induced dipoles as witnesses by variable dipole moments depending on the local environment (see pp. 16-17 in the handbook). · 3 (hexane, carbon tetrachloride and benzene) look as though there’s a possible HSP-based formula if Ruelle hydrophobic corrections can be included. · 2 (chloroform, ether) are not yet explained. This is not a good starting point for those who want a generalised model for liquid-liquid extraction with other solvents! 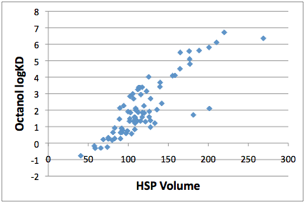 Almost certainly the deviations from HSP predictions would be a lot less if neither liquid is water. At the time of writing we don’t have a dataset for such systems with which to test the model. As this is such an important area, the HSPiP development team will continue to explore options to create a robust modeller to add to the software. If we do, then this chapter will be significantly revised!